I've written and re-written this post 3 times. I think I'm hesitant to share my view of the afterlife because I don't want to be criticized or debated. I don't want my cousins to feel like I am using their loss as mere fodder for my blog. So I'm just going to put this out there and say it's from the heart and it doesn't begin to describe the fun and loving woman who slipped from this earth today. My Aunt Connie passed away today after a long and valiant battle against ovarian cancer. I am sad that she is gone, but have found myself comforted by what I'm choosing to believe happened in heaven this morning. When Connie arrived, escorted by angels, I imagine that God met her at the pearly gates with a huge hug, nodding his head, saying "very good, very good" -- which was one of Aunt Connie's signature phrases. Tell her about a deal you got on a pair of jeans and she would smile, nod and say "very good, very good." Share a joke she enjoyed and get a "very good, very good" in response. In my mind, God was not the only one waiting for Connie's arrival. My NaNa (Connie's mom) and MaMa (her grandmother) were there too. Seeing the three of them together again brings a smile to my heart. In no time at all, I'm sure NaNa showed Connie where the Ohio State loving angels hang out. It's been a year of loss in our family, as my sister lost her father-in-law in January. I'm sure Steve was on the welcome wagon, too. His love of running and beer and his sense of humor reminded me a bit of my Uncle Ed, Connie's husband. I like to think that Steve is there to look out for Connie. It's probably a juvenile view of heaven and probably not 100% theologically accurate, but today it has helped me. I think Aunt Connie would even nod and say "very good, very good." 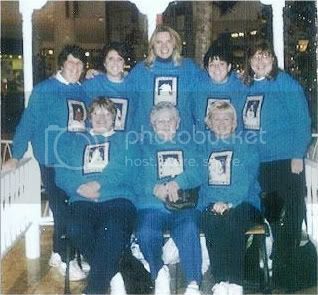 The pic is fuzzy, but Aunt Connie is the first on the left in the front row. You have had a rough year Amy. I am sorry for your loss. I love your view of heaven! I have the same view. Both of my grandparents died in a 9 month period. Grandpa went first and Grandma went on her birthday. I know that Grandpa (and everyone else) welcomed her with a great big birthday party! i think your view of heaven is a beautiful one!!! As for your view being juvenile, the bible speaks highly of faith like a child. My guess is your version is closer than most. That is exactly theologically correct. Your sweet aunt was welcomed by those who've gone before her and it was indeed, a sweet reunion. Still, it's hard for those left behind to deal with the loss--which means she did her part while she was here--loved loved loved. That's the best thing that could be said about a person. They know how to love. I expect my grandmother and brother to be in heaven to welcome me when the day come. First of all I am so sorry for your loss, Amy. It saddens me that so many of us over think what we post on OUR blogs because of fear. While I completely understand your fear of others reactions I just wish it didn't have to be that way. I don't believe in an afterlife. At all. Your post made me smile. It warmed my heart. You views may not be the same as mine but they make up part of who you are! I also think that the way in which we think before we post is what makes us good bloggers. Some people put things out there without any thought into how it might infiltrate the world. I hope that your views continue to bring you peace during this time, and am so sorry to hear about your Aunt's passing. Thanks everyone for your condolences. Thanks, especially to Leticia for being honest and embracing despite our different beliefs. And hotmess -- I can't imagine losing a sibling. Prayers for you, too.